Celebration of macabre literature is success for department. 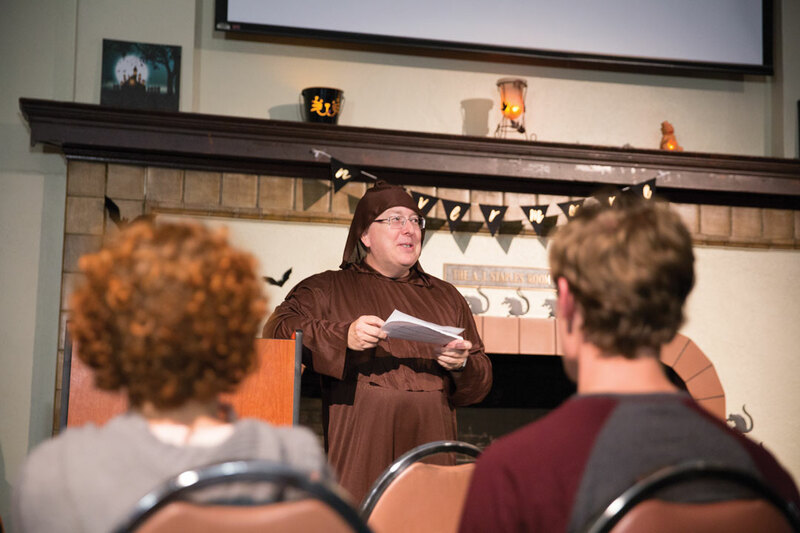 The Department of modern Languages and Literature at California Baptist University hosted the fourth consecutive “Unhappy Hour” on Oct. 30 in the A.J. Staples Room. The event providing a platform for literature and scary stories. Dr. Laura Veltman, professor of American literature, established the evening in theme, joking, “You are all too happy,” which was followed by a night of petrifying poetry reading and exciting excerpts from longer pieces of literature to set the spirit of the room. The event was broken into Halloween-themed sections. The first event was a game of bone-yard bingo that continued throughout the night. Words placed into a bingo style board could be crossed off as live readings of poems using the words were spoken. Prizes were awarded as participants won the game all throughout the event. After the ongoing game was introduced, poetry was read aloud at a podium in front of the group of attendees. Edgar Allen Poe, Charles Dickens, William Shakespeare and other poets also were celebrated for their focus on the fantastic as well as their literary merit. Dr. Jennifer Newton, associate professor of English, read an excerpt from “Beowulf” in its original Old English, accompanies by the same passage translated into modern English. Each version, scary in its own right, brought the spooky theme of the event together with the theme of education through performed literature. Adeleigh Sexton, sophomore music performance major, noted the emphasis of creative liberty in the readings. “The freedom for everyone to speak on any passage in whatever tone or accent they wanted made for some really funny performances,” Sexton said. Veltman said she particularly enjoyed the mixture of the two themes. “It’s people enjoying reading poems to other people. When else does that happen?” Veltman said. She said she appreciated the mixture of the crowd; some eager to read their favorite morbid piece, dressed up and doing voices, while others were more comfortable waiting to be persuaded to read. Sexton said she was thrilled the event prepared her for the Halloween season.